Blog / Pest Management / Weeds / It’s time to attack Poison Ivy! It’s time to attack Poison Ivy! Goats: Not practical in every situation but can be effective. Weeding or hand pulling of the whole plant, including the roots: Effective but again not practical for many of us. 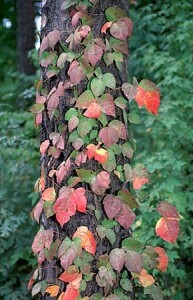 Flame: Works for many weeds but NOT FOR POISON IVY! Breathing the smoke is extremely hazardous! Foliar spray of a chemical herbicide: From midsummer into fall, before the leaves turn color: Glyphosate, triclopyr, dicamba and 2-4,D are the most commonly available in garden centers. These are the active ingredients listed in small print on the front of the container. Read and follow the label directions. Add a sticker or surfactant if called for to help the chemical adhere to those shiny leaves. Cut stump treatment: For major vines that are climbing trees, cut the vine and immediately treat the stump with a concentrated herbicide. Use a spray, brush, sponge or wick. 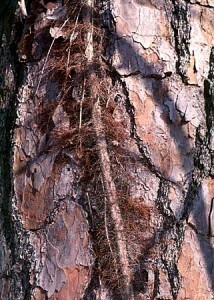 The best time for this approach is late winter into summer when the plant is actively growing, not now. In many cases, and depending on how long the problem has been growing, the control project will be more than just a one-shot deal. 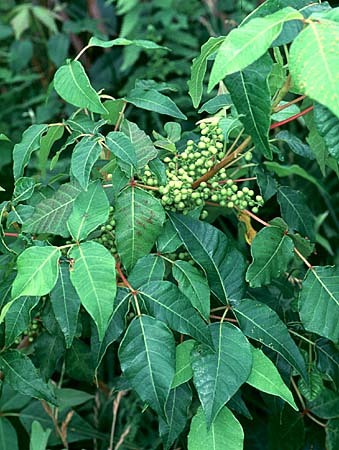 For example, the NCSU bulletin on poison ivy suggests severing the vine that has grown up a tree as step one, followed by poisoning the stump and perhaps mowing the shrubby part to the ground so the live plants may be more easily treated with an herbicide. Bottom line: The sooner a problem plant is recognized the easier it will be to handle.